Tired of soggy sandwiches and meltwater warming your drinks? Then buy a personal thermoelectric cooler. Thermoelectric coolers are lighter, drier, more efficient and easier to use than traditional ice-fill coolers or compressor-driven electric coolers like the Dometic. And the Igloo Iceless is one of the best small thermoelectric coolers you can buy. The Igloo Iceless Thermoelectric Cooler is ultralight, and compact design makes it an excellent choice for a vehicle cooler, camping or outdoor activities - wherever you have access to a 12V outlet - like a 12V cigarette lighter. Prices for the Igloo Iceless start at $92.00 for the 26-quart version - the larger 28-quart size costs a little more. If you are looking for something a bit larger, then check out other good choices in our recently-updated thermoelectric cooler buying guide. Like most other thermoelectric coolers, this cooler is just a fridge. It will keep your food and beverages cold but not frozen. It also will not freeze warm food for you. So if you want to store frozen food or ice in the Igloo Iceless , then pre-freeze it before you drop it in. Once you transfer it to the cooler, however, it should stay frozen for a day or two. Lots of thermoelectric coolers cool and warm, but this one doesn't. If you need one that does, then check out our thermoelectric cooler buying guide. This is a thermoelectric cooler. It’s different from a traditional ice cooler or a compressor cooler like your refrigerator. You can read more about how a thermoelectric cooler works in our buying guide. But in a nutshell, the cooler uses a small component called a Peltier thermoelectric plate the size of a matchbox to transfer heat from inside the cooler to the outside. Lightweight. 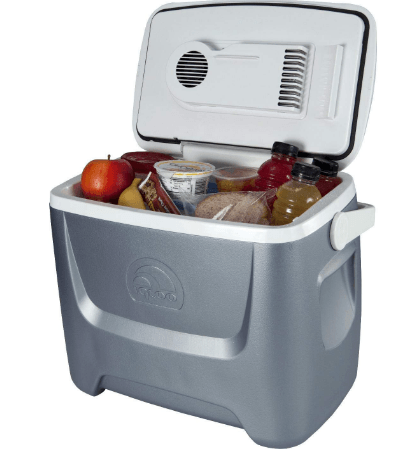 Because the cooler doesn’t contain a compressor, motor or refrigerant - or require lots of heavy ice - it is very light. Easy maintenance. There are no moving parts in a thermoelectric cooler, which makes maintenance easy and lengthens the life of the cooler. Thermoelectric coolers use less power compared to compressor coolers. Unlike compressor coolers, thermoelectric coolers cannot cool your food and drinks down to a specific temperature. They can only cool down to a set number of degrees below ambient, or outside, temperature. In other words, the temperature of your environment determines how cool the interior can get. The hotter it is in your car or outside, the less cold the cooler can cool. The Igloo iceless cooler can cool your drinks or snacks to 36 degrees F below ambient temperature. That’s its cooling capacity. If you travel to a really hot area, let’s say 100 F, this Igloo cooler will maintain the internal temperature of 64 F.
As you can see, thermoelectric coolers like the Igloo Iceless don’t perform very well in really hot climates. But at anything less than 90 degrees F, the Igloo Iceless cooler will keep your stuff perfectly chilled. One of the most significant advantages of thermoelectric coolers is their compact size. Because there are no complicated cooling mechanisms or ice to take up space, almost all of the available interior capacity is yours to use. This Igloo weighs just 10 lbs but can hold 26 or 28 quarts worth of stuff. That’s way more than most hand portable compressor coolers of this size - more than any ice cooler, too. The 26-quart cooler can hold up to 32x12oz cans. The 28-quart version will hold a couple more. When empty, the cooler weighs 9-10 lbs depending on whether you pick the 26-quart or 28-quart one. Of course, this Igloo is going to be much heavier when loaded with drinks and snacks. But the swing-up handle and ergonomic curved design make it easy to carry the cooler in one hand. If it’s too heavy, the handle is long enough for two people to hold and lift. The Igloo thermoelectric cooler is small enough to place in between car front seats where you can easily access it while on the road. 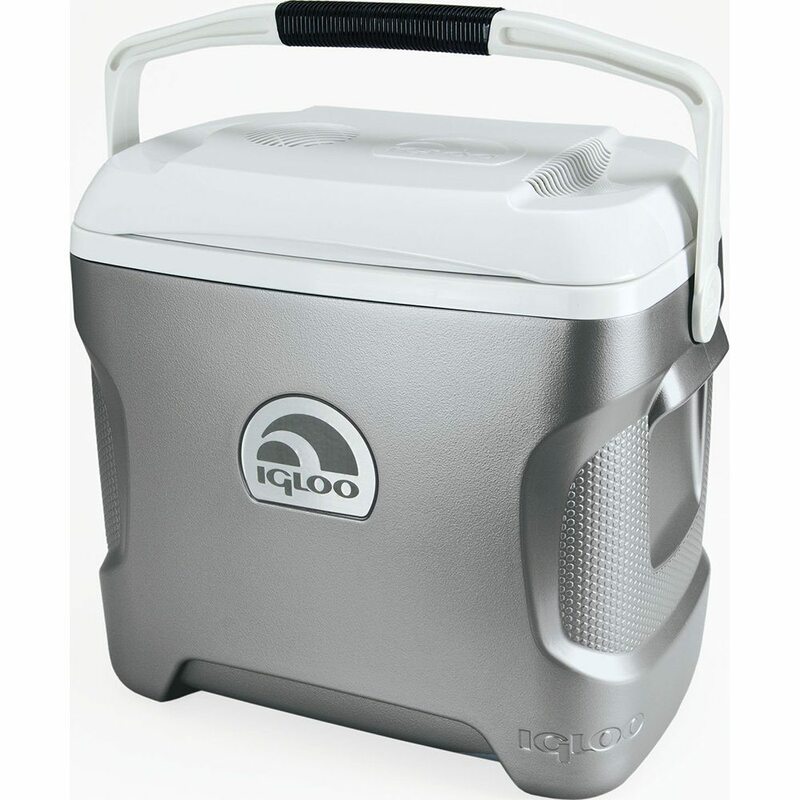 Like most portable coolers, the Igloo iceless cooler is powered by a 12V DC outlet. You can plug the 8 foot power cord into your car’s cigarette lighter or into the DC outlet of a portable generator. If you power it from your car for more than two hours, you might want to turn the engine on for a few minutes. If the engine is turned off, do not leave this cooler plugged in for more than two hours as it could drain the battery. If you want to plug the cooler into an AC outlet when you get home, or you are in a hotel room, Igloo sells an AC power converter separately for about $50. Note: the Igloo Iceless thermoelectric cooler does not have USB charging or a battery backup option. 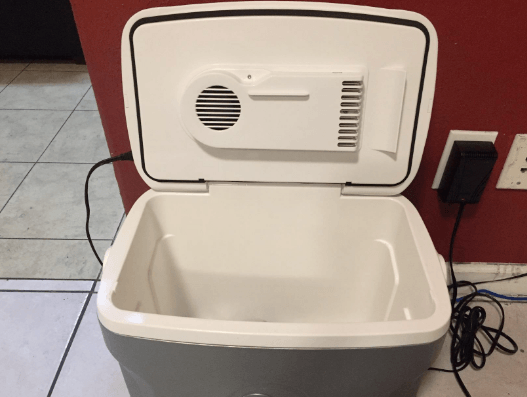 You are looking for an affordable electric cooler large enough for a small family road trip or lunch for 3-4. You want a personal cooler to take on the road for work or long trips. You don't plan to use the cooler in super-hot climates.